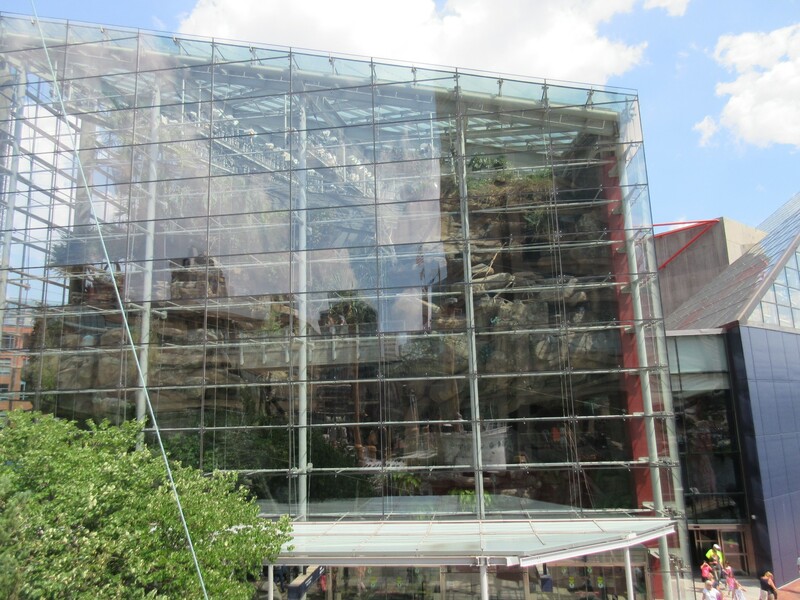 Our 2017 Road Trip, Part 26: All Around the Aquarium « Midlife Crisis Crossover! 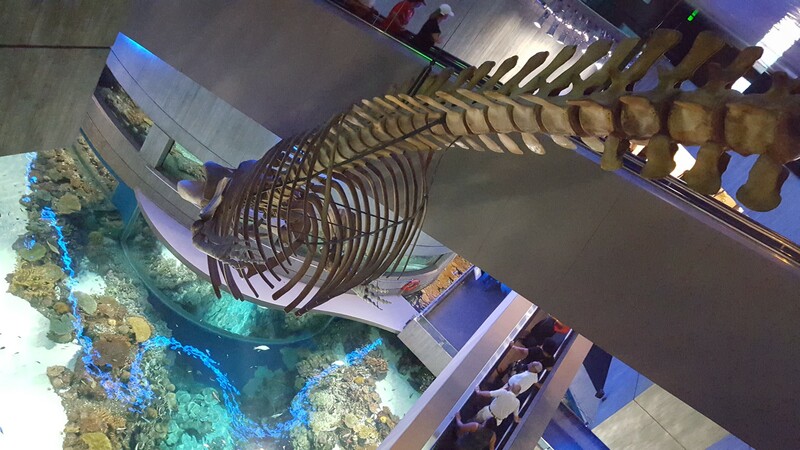 Giant fish fossil suspended from the ceiling and hanging down several stories welcomes you! The next stop on our scenic tour of Baltimore’s Inner Harbor has already popped up as an Easter egg in previous chapters. 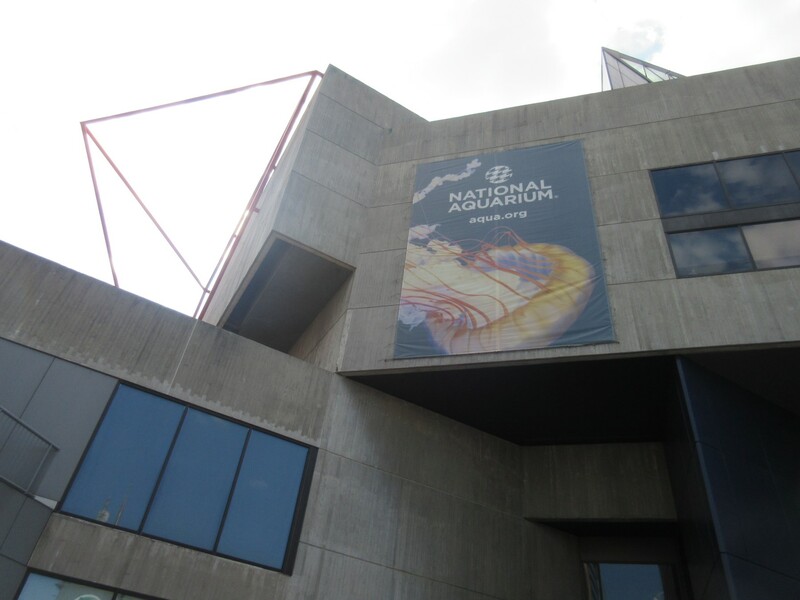 The National Aquarium is an institution so large, it needs two piers and at least three buildings to contain it all. 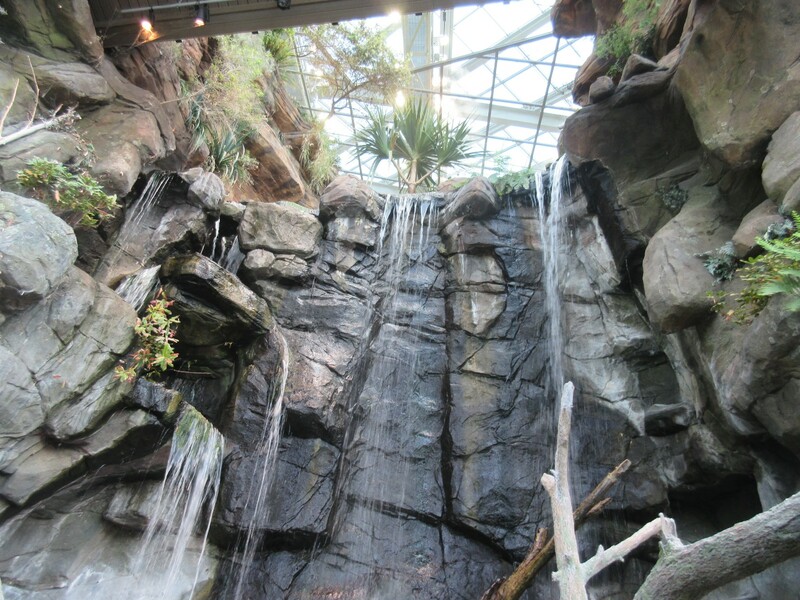 Over two million gallons of water house 17,000+ specimens from several hundred species, some of which were transferred over when the National Aquarium in Washington DC closed its doors in 2013. 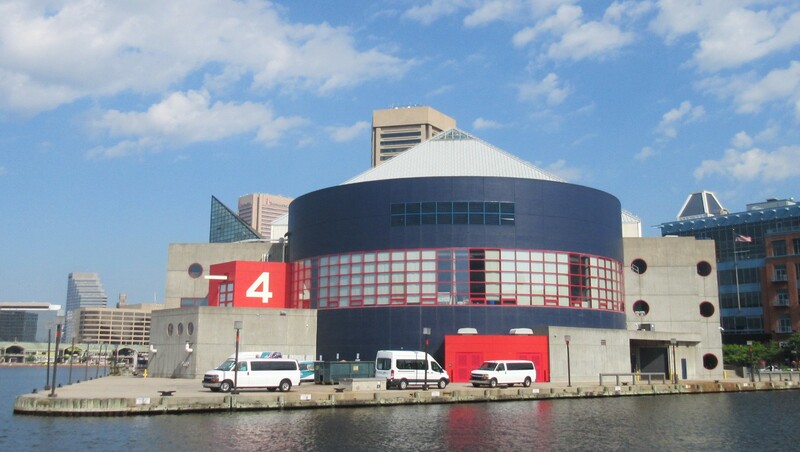 As you’re walking around the Inner Harbor, the aquarium is impossible to miss. Our first sighting of the Aquarium’s east end on Monday morning, day 3. The view from one of our water taxi rides. The official sign on the west side. When your structures are this massive, who needs a showy sign? 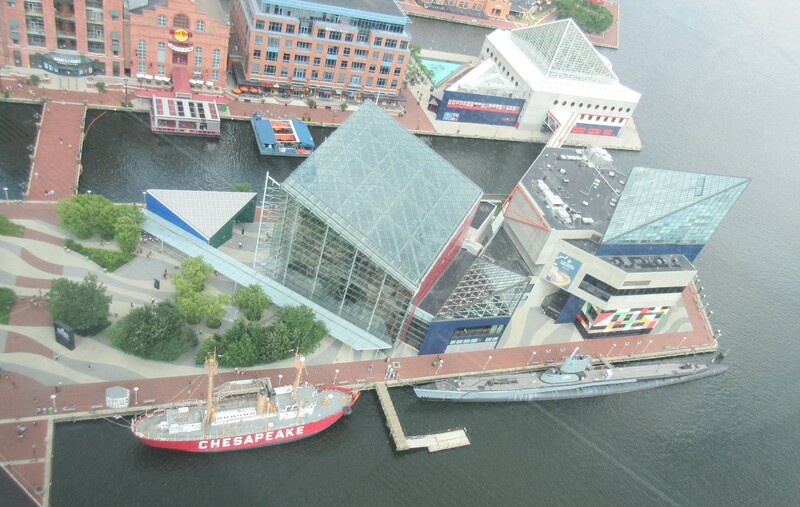 Piers 3 and 4, the totality of the National Aquarium and a few neighbors (including the Chesapeake and the Torsk), as seen from the 28th-floor observation deck of the World Trade Center. The main building on Pier 3 was opened to the public in 1981. The Pier 4 Pavilion houses the mandatory dolphin tank, along with a temporary exhibit that merits its own chapter later. Towering over the entrance is the Glass Pavilion, a twelve-story expansion built in 2005. We saw nearly every inch of its aggregated exteriors well before we finally got around to going inside on the afternoon of Day 4. We arrived in the middle of rush hour and a couple of hours before closing, but thankfully had time to see virtually everything we’d hoped and then some. Our view of the Glass Pavilion from the deck of the Chesapeake on Day 3. 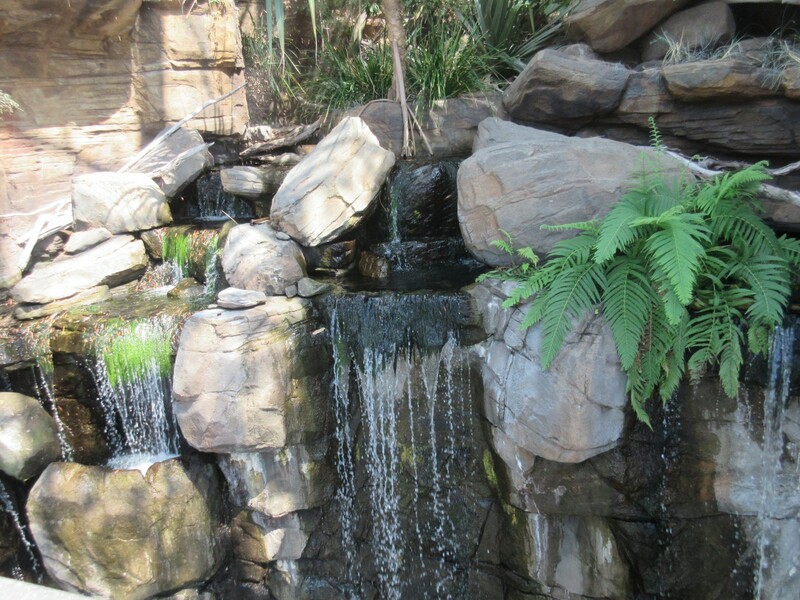 First stop after entering is a refreshing indoor waterfall. Sadly, only the aquatic life can play in the pool below. The walkways and ramps carry you onward and upward until you eventually reach eye level with the source. 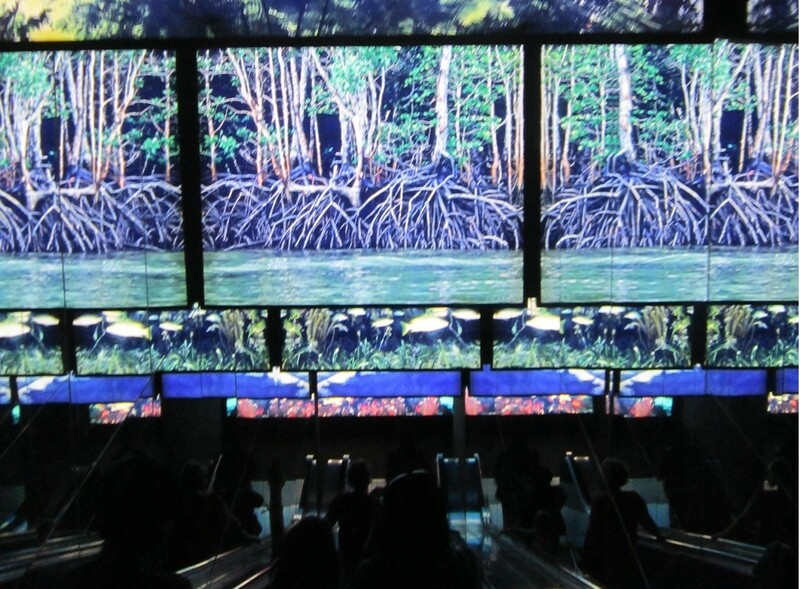 Your tour through the Aquarium is a fixed path, but I wouldn’t call it linear. It’s long and winding and can feel confusing as you walk around the exhibits and the wonders, but it really is designed so you’re seeing exactly what everyone else is, and in the same order. In a way it’s like Final Fantasy XIII minus combat. Numerous odd constructs decorate the interiors along the way, including these floor-to-ceiling water cylinders whose purpose I totally missed. 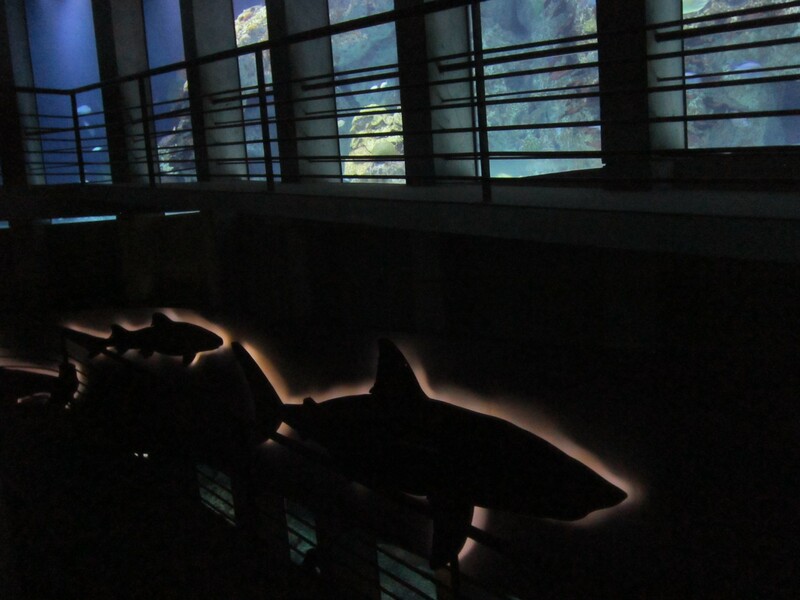 The multi-story Shark Alley is a ring of ramps that lets you walk around and around the predators while they swim their laps. 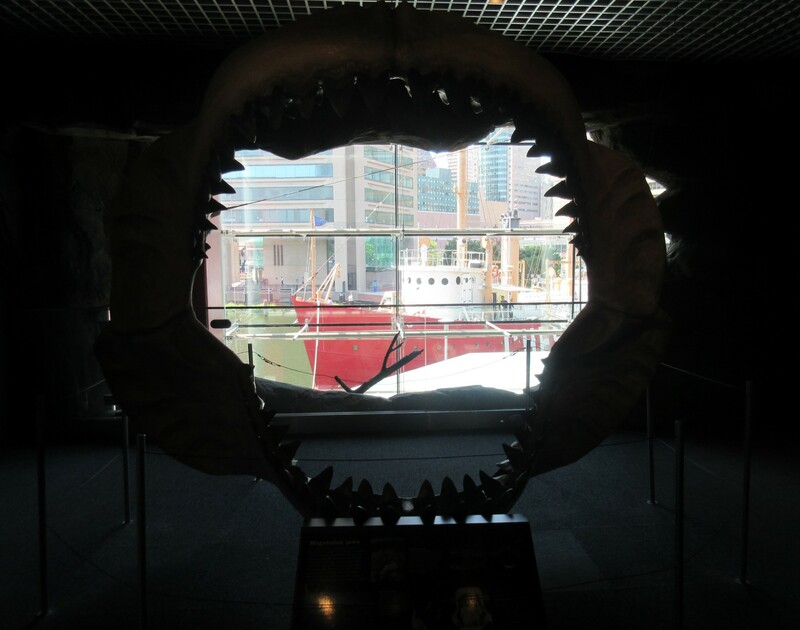 Other fossils include shark jaws., a beloved staple of every aquarium we’ve visited. Wave hi to the Chesapeake outside! After our long day of travel through the neighborhoods surrounding the Inner Harbor, the National Aquarium was a cool respite from the summertime heat. The experience meant several more blocks of walking and no time for resting, but somehow we didn’t feel the pain as we enjoyed the fancy architecture and lighting, and gallivanted up and through the halls and bridges and escalators. 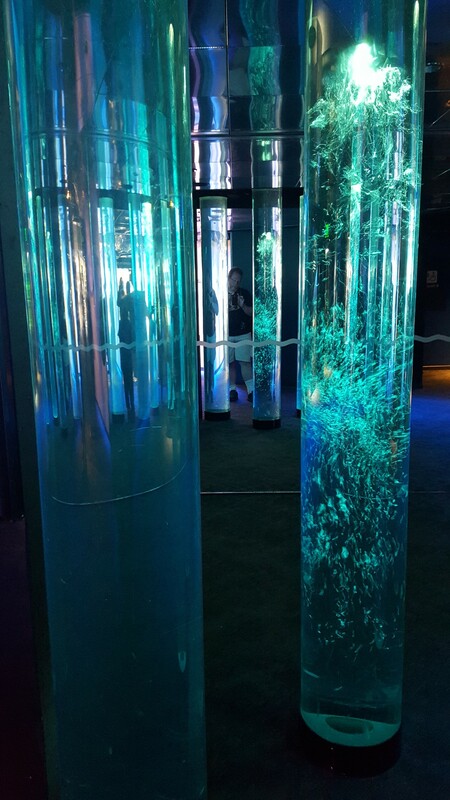 If your idea of a good time is power walking and spooky interiors, the National Aquarium might be your kind of playground. …oh, wait! Almost forgot: also, there are fish. To be continued!